Learn about our many volunteer opportunities by reading the descriptions below. Then, fill out a volunteer application by clicking on your nearest service site! Looking to volunteer with a group? Click here to learn about forming a Welcome Team. Refugees attend many appointments during their first few weeks in the United States. Volunteers can provide child care to refugee children, while their parents learn invaluable information about resettling and adjusting to life in the United States. Administrative volunteers provide support in our offices, assisting with professional tasks such as answering phones, greeting clients, and other administrative needs. Interpretation services are needed frequently, due to the limited English abilities of many refugees. At RST, our most needed language skills are Arabic, Spanish, Burmese, Nepali, and Dari. RST offers legal services in multiple languages to refugees, asylees, and Cuban parolees. Volunteers interested in learning more about immigration are welcome to assist our attorneys as they provide services to refugees and other immigrant populations. A legal background is preferred but not required. An estimated 27 million people are enslaved today. Volunteers can assist our Survivors of Trafficking Empowerment Program (STEP) as they provide services to survivors of trafficking through outreach and trainings, building community resources, and working directly with staff. Welcome Teams provide refugee families with a supportive network as they adjust to life in the United States. They are paired with a refugee family prior to arrival, and assist with everything from apartment set-up all the way to enrolling children in school! Welcome Teams are an excellent opportunity for volunteer groups interested in working with refugees for an extended period of time. Guardian Angel Project (Houston Only) With more unaccompanied children (UAC) from Guatemala, El Salvador, and Honduras coming to the United States seeking asylum, many are taking their cases to court without attorneys. In the Guardian Angel Project, Spanish-speaking volunteers are trained to observe court proceedings to ensure each child's case receives fair treatment. Volunteers have the opportunity to create a welcoming environment for newly arrived refugees by setting up an apartment with household items and groceries. 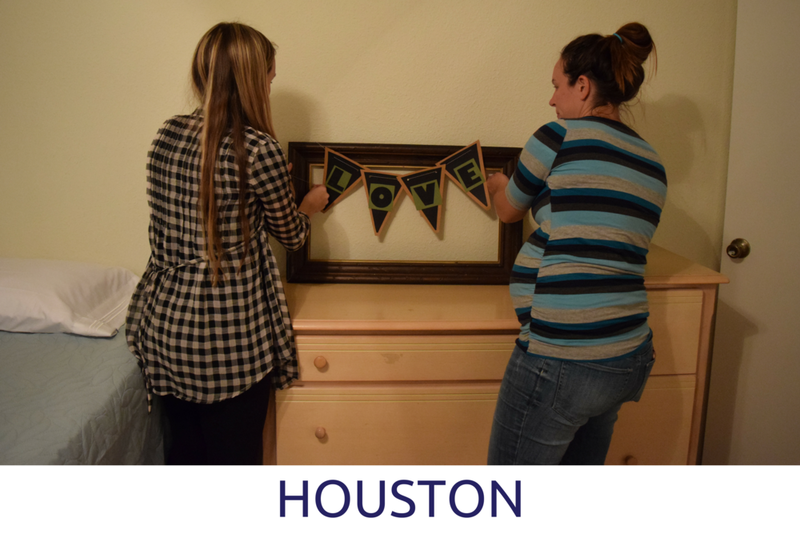 Apartment set-ups are fun and allow volunteers to create a warm and comfortable home for refugees! Refugees do not have have personal transportation upon arrival, and need training on public transportation. Volunteers can assist refugees in transporting to appointments and teaching refugees how to use local public transportation. Transportation volunteers are a vital part of a refugees achieving self-sufficiency during their new life in the United States. Learning English is one of the biggest challenges refugees must overcome. Volunteers can spend time with individual refugees teaching them basic English conversation skills, or work directly with licensed ESL providers in the classroom. Teaching experience is preferred but not required. Volunteers have the opportunity to work directly with our case managers to assist in providing direct services to refugees. This opportunity is great for students and young professionals looking to build case management skills. Self-sufficiency is the goal of all of RST’s programs. Volunteers can help prepare refugees to enter the American workforce by assisting with resume writing, mock interviews, creating a budget, and understanding bills. Volunteers work with staff in facilitating Cultural Orientation classes for newly arrived refugees. Volunteers teach refugees U.S. laws, customs, traditions, and engage in conversation on what their new life looks like in the United States. ALL VOLUNTEERS RECEIVE TRAINING PRIOR TO GOING ON VOLUNTEER assignments.